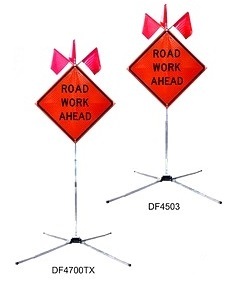 Dynaflex 4000 is a heavy-duty sign stand designed to hold roll-up signs 5 feet or 7 feet off ground. Dual horizontal coil springs flex for stability in strong wind. Folds up for easy handling and convenient storage. Adjustable legs with anti-skid foot pads. Kick-release legs for quick deployment. 38 lbs. Folds up to 8.5(w) x 12.5(h) x 60- or 85- inch length, depending on size. This stand is crash-tested and NCHRP 350-compliant.